A new brand of bottled water sourced in the Midwest has come to Chicagoland. GIVN® Water, a socially conscious premium spring water brand that provides clean water to people in need, is now available at 185 Jewel-Osco stores in the greater Chicago area. Jewel-Osco is based in Itasca, Ill., operating 185 stores in Illinois, Indiana, and Iowa. Available in single-serve 700-milliliter and 1-liter bottles at Jewel-Osco and competitively priced with other premium bottled water brands, GIVN Water is bottled at the source from protected natural springs near the Nicolet National Forest, WI and the Blue Ridge Mountains, TN. It is naturally alkaline with high levels of naturally occurring electrolytes and zero additives. 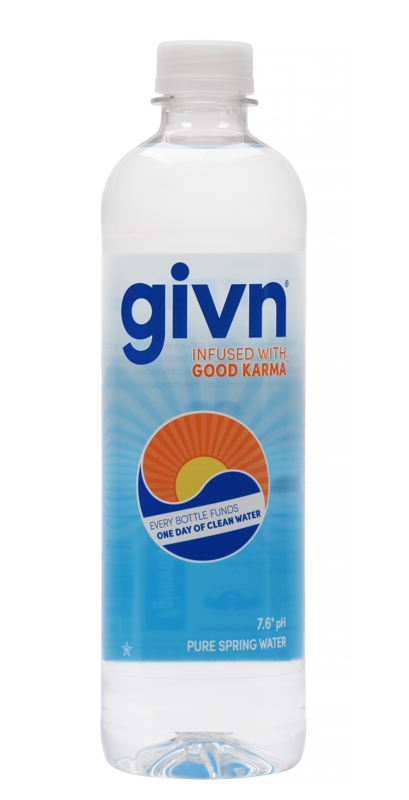 Customers in 28 states drink GIVN Water, and the premium bottled spring water will soon be available in about 300 retail locations in and around Chicago, Madison, and Milwaukee, as well as on Amazon.com. To date GIVN Water customers have funded more than 500,000 days of clean water to people in need throughout the world via the company’s partnerships with nonprofits like WaterIsBasic.org. Visit givnwater.com for more information. GIVN® Water is a registered trademark of GIVN Goods Inc.